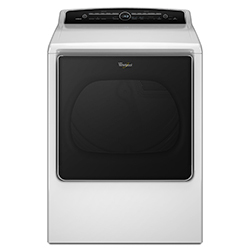 This Whirlpool® Classic WTW4800BQ top-load washer offers a capacity of 3.6 cu. ft., which allows you to wash up to 2 baskets of laundry in one load. It also provides extra space for large loads and bulky items like comforters. In addition, the white porcelain wash basket adapts to both large and small loads and provides optimal fabric care. 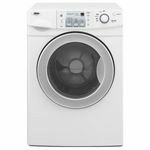 The white Whirlpool WTW4800B washing machine offers a Smooth Motion agitator with specially designed ridges that gently bring laundry to the bottom of the wash basket where cleaning takes place. It can effectively roll over and clean twice the average size load. Every other day use. Handles bulky items well and when finished, items are almost dry. Simple and economical. Works great! Have had it for 2 years. Great machine! Cleans well and is quiet. Will rebalance on it own. However, I wish it would not drain after 6 minutes if I leave the lid open so I could soak the clothes as long as I like before washing. I also would like to be able to adjust the water level after it starts if I realize I would like more or less water. (I guess this is the way washing machines are made these days) (These complaints are for the manufacturer) I have lost control of how I want to wash the clothes, with all these computer parts that make the decision for me. Sometimes more simple is better and it would be less expensive as well. 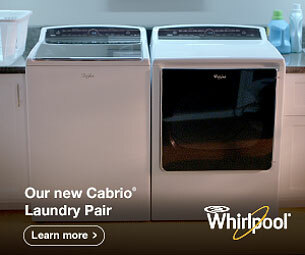 I have a Whirlpool Top Load Washer. 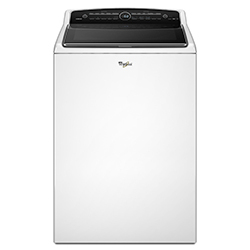 I have a Top Load Whirlpool Washer that I have owned for approximately 9 years. This washer has given me years of service which I am truly happy about, because I'm not ready to purchase another one. It has several wash settings, including Handwashing, which is great because a lot of clothing that is marketed today is handwashable. It has different temperature controls and a fabric softener dispenser. This washer is an economical choice that I purchased at a reasonable price at one of the local Appliance and Home Furnishing Stores. 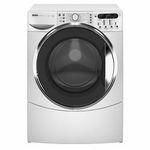 I would make a recommendation for this type of washer if you are in the market for one that is inexpensive and is energy efficient. Plus, it contains a large capacity tub for large loads of laundry. I'm glad about the service I have received for the number of years I have owned this washer. Energy Efficiency It is energy efficient, one of the reasons I made this purchase. Cleaning Time It washes a load of laundry usually in about 20 minutes. Performance It works great. Ease of Use Very easy to use and operate. Design The design with the top load I like and the detailed knobs and instructions for use under the lid is useful for someone that doesn't know how to operate this type of washer. Durability It has given me 9 years of service. This is the longest lasting washer I have ever used. 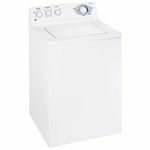 This washer is a great washer that I have had for many years and still runs like new. I have not yet had any problem out of this washing machine, and quite frankly I don't think that I ever will. I have had this washer for at least four years and I still have not found any other washer that would last as long as this one has. This washing machine has a faster run time then our previous washer did so we like that too. Energy Efficiency This washing machine uses less water than most washing machines which saves you money and that is a good thing. Cleaning Time This washing machine has a quicker cleaning time which means that it uses less electricity. The cleaning time for this washing machine is between 20 and 30 minutes. 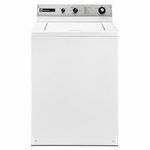 Performance The performance of this washing machine could not be any better it has a much shorter cleaning time than many washing machines and it also uses less water, this makes it one of the best washing machines you can purchase. Ease of Use On top of everything else that this washing machine does it is also easy to use which saves you time. Happy to go back to a top loader that really cleans. I bought into the front loading machines and owned two before converting back to the old top loader and I couldn't be happier. Having a front loader means having to leave the door open and blocking the path to keep it from mildewing. Not a problem with this machine. This machine does it's job and gets the clothes clean with no hassle. I had forgotten how good the old style machines cleaned clothes and in less time. Not sure how using less water in a front loader could make up for quicker washing using less electricity. I had my last front loader repaired a couple of times and had to regularly bleach and clean the tub to keep the mildew smell out. I wanted to go back to the agitator washer but I didn't want to waste money on my fairly new front loaders. As it turned out, my daughter was looking to buy a washer and dryer and she wanted the new fad front loader. I gave her my front loader and bought this wonderful cleaning machine. I had memories of fresh smelling clean clothes from times past but now they are not just memories. This has just enough selections to meet all of my needs. The locking lid is something new from the old agitators but it's not a problem. It has a pause button if you need to add something to the wash. I wasn't looking for a bunch of digital readings. I just wanted a washer for what I used it for-set it and let it wash. I love this machine and would highly recommend it to anyone who wants clean fresh smelling clothes from a great machine that will not break the bank in purchasing. Energy Efficiency This is not one of the top energy efficient machines but I believe it beats a front loader because it washes in less time. Cleaning Time You have a choice of either one or two rinses. One rinse will cut down the time it takes to complete the load and it beats my prior front loaders by far. Performance I couldn't be happier with the cleaning performance of this machine. Ease of Use Simple to use and no digital buttons. Turn the knob to what you want and go. 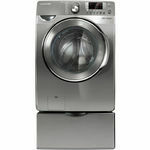 Design The knobs on the machine are easily accessed and the tub is sufficient to wash a fairly large load of clothes. Durability I have only had mine for a couple of months but it doesn't appear that I will have any problems or issues with this machine. It feels like it will be very durable.